I was watching a news report on avalanche survival. Correction: There was a news report on avalanche survival on TV, playing in the background while I was busy doing three other things. I live in Florida, don't ski, do not climb mountains and won't get too close to the walk-in freezer. I have about as much chance of being caught in an avalanche as I do of waking up tomorrow: age twenty-one, blond and thin. I didn't think I needed to pay attention to that report. That evening I was playing couch potato relaxing with a book and my mind started replaying key actions for surviving an avalanche. I suddenly realized not all avalanches involve mountains and snow. Sudden events can happen in life any day, any place. 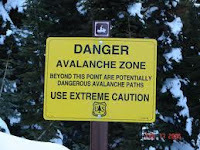 Severe illness (physical or mental), unemployment, assault, unexpected death of a loved one or a 'perfect storm' of life's many complications all happening at once, can duplicate the same conditions of being in an avalanche. The powerful wall of snow hits. We find it hard to breathe. There is a crushing weight pressing painfully against our body. We feel cold, so cold; unable to find warmth, we shiver. We feel we cannot move - the effort only increases the weight against us. We feel isolated, perhaps unable to get others to hear our screams because we cannot get the air in our lungs to scream. We are cut off from the world and the world my not even know where we are. 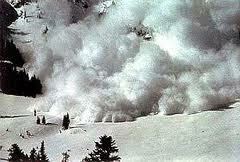 Avalanches don't just happen in snow. They can happen answering the phone, crossing a street, answering a knock on the door, eating a meal. The keys to surviving an avalanche in our lives are no different than the things that will help us survive a wall of snow on a melting mountain. Put your hands in front of your face to create a breathing space. Establishing a good airway is always the first thing in securing a rescue. In no-snow terms I translate this to mean not getting so entangled in what is engulfing me that I forget life's basic necessities. I still must breathe, eat, void, sleep. Breathing space is not overeating space. It is not suddenly okay for me to eat crap just to get through whatever is hitting me. I think this can be the hardest key to remember once the avalanche hits but it is the first and most important thing I need to do to survive because it is not enough to just barely make it - I want to emerge whole. Attempt to move out of the way of the force but do not try to outrun it because you can't. I might be able to sidestep some of the stress rushing at me by seeking medical help, financial guidance, family support or spiritual counseling. If I simply try to outrun it, it will swallow me whole while I am swallowing a whole pizza. I have to take whatever steps are necessary to get me as far out of harm's way as possible. When escaping the onslaught I cannot hide in the refrigerator. Wear an emergency beacon or make sure someone knows where you are. I could be knocked out, covered by tons of snow. Emergency beacons work by activating if you are covered in snow. It has an alarm with a GPS locator. In the everyday living of keeping the pounds off, I talk to several people regularly by phone, in person and on line. If I cannot be reached - they find me. They are my emergency beacons. They know if they have not heard from me for too long it could be a matter of life and death and they will not let me die. 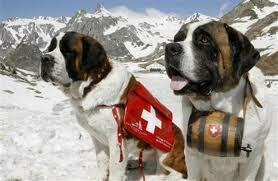 They will be my St Bernard and I will be theirs. I am safe and secure today but if an avalanche hits me in the future, I have some comfort in knowing there are keys to avalanche survival that will help me to survive. What keys do you have in place if an avalanche slams through your door? Very nice metaphor and good advice. You're right - we can get struck at any time. Love this post! 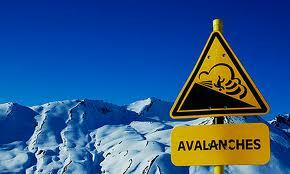 I had my own avalanche to hit me last may and I'm still digging out of it(it involved my son). I am 39 yrs old,and it has been the worst thing that has ever happened to me or my immeadiate family. I would also like to add to your list faith. At times this past year, things have been so desperate that if I didn't have my faith to fall back on and prayer,I really would have lost it. I agree. Faith is essential. I suggest it is a matter of "Trust God and continue to row to shore!" I think of how many times in the past I have seen various bloggers receive comments (on crisis posts) saying "don't worry about your food and exercise now, just do what you need to do." in other words - enabling, codependency comments. It would have been very hard for them to see their comments as enabling and certainly not codependency. I very much appreciate your blog because it is the voice of sanity.